The vogue of two-item restaurants has spread across London, with new haunts such as Burger & Lobster (which serves burgers, lobster rolls or lobsters), Bubbledogs (serving hotdogs and champagne) and Duck & Waffle (serving duck confit waffles) drawing in London’s trendiest diners. 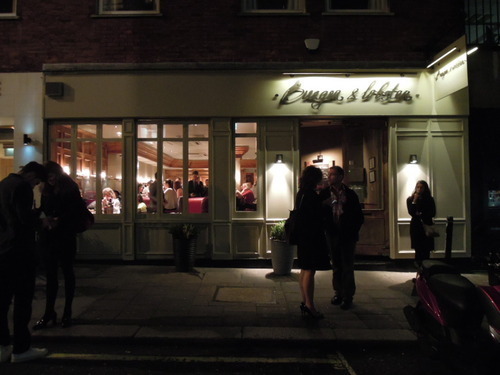 Located near Green Park Station with a new branch in Soho, Burger & Lobster is a very west-end sort of place. At the entrance is a chalkboard menu offering just three options – burger, lobster and lobster roll, all served with (unlimited) chips and salad, all for £20. 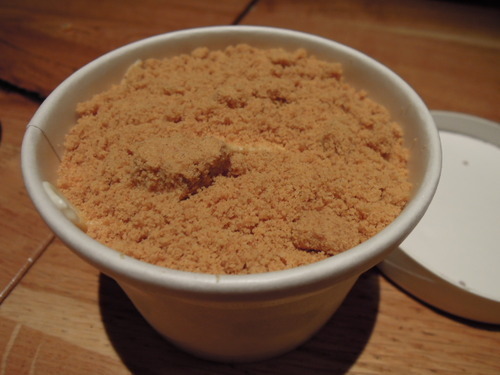 The menu is not as limited as it seems at first glance, and you would be glad to hear that variations can be made. Lobsters, for example, can be steamed or grilled, even though we highly recommend the latter, as the grilling products really locks in the moisture and brings out the sweetness of the lobster meat. You could choose between garlic and lemon butter or plain butter to go with your lobster. As for the burger, with a patty made of ten ounces of freshly ground beef, you could choose to have it plain, or with cheddar and/or bacon. 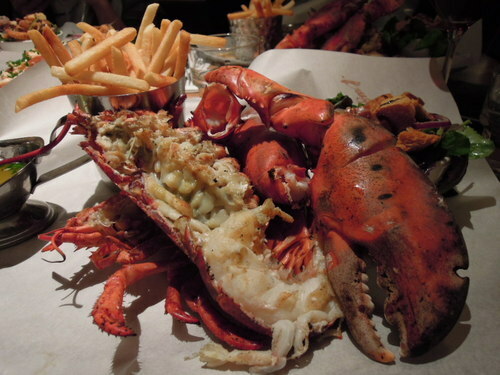 (1) Since there were more restaurants in London serving burgers than there were lobsters, our table of four all opted for one grilled lobster each. The sight of the dish alone was enough to impress, with a bright red lobster theatrically brought to you on a large metal tray. Taste-wise, it was nothing short of perfection – the lobster meat was fresh, firm and supple, grilled just right so that the meat acquired a wonderful smoky taste without losing its own flavours. Every mouthful of it, dipped in melted garlic and lemon butter, was an experience of a lifetime. 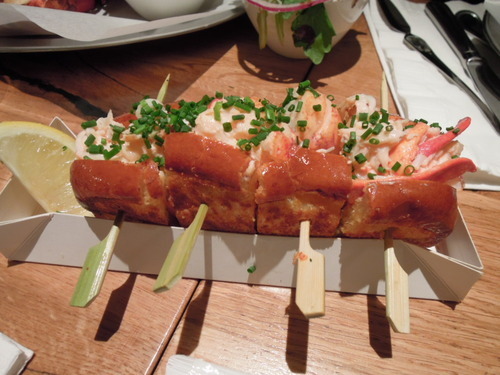 (2) The waiter casually recommended that we ordered a lobster roll to share, and we did. 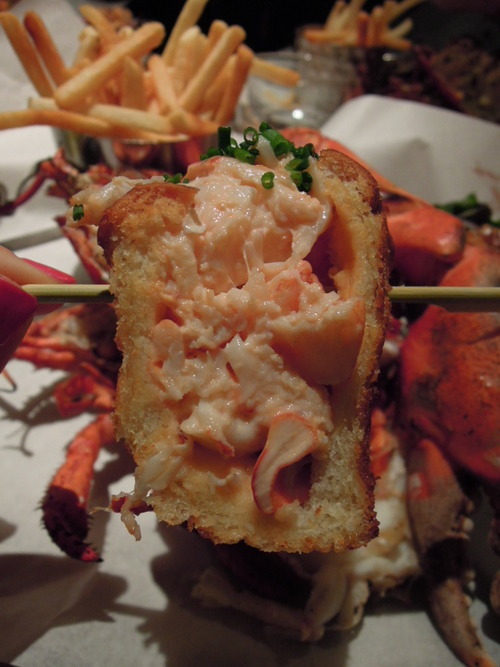 Lobster meat, coated in a wasabi mayo, was sandwiched in a toasted brioche and sprinkled with some finely chopped chives. Full and completely satisfied with our grilled lobster, we thought that it was impossible for the meal to get any better, but it just did. The lobster meat were bursting with profound flavours, and the wasabi mayo added an indulgent creaminess but also a kick. The buttery brioche was so thin and well toasted that it almost melted in the mouth, and when eaten with lobster meat that had such a gorgeous bite to it, was delicious beyond description. 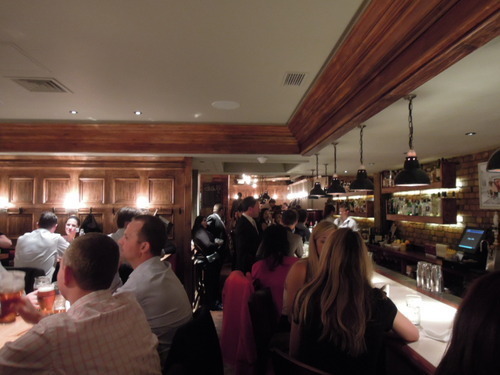 (3) Since the Lobsters and the Lobster Roll were so heavenly, we simply could not resist trying out their desserts. It was a bit anti-climatic when the desserts were brought to us in paper cups, but at least the taste made up for their presentation! The lemon mousse was light and refreshing, with fresh lemon zest in it giving it a bit of citrus tang. 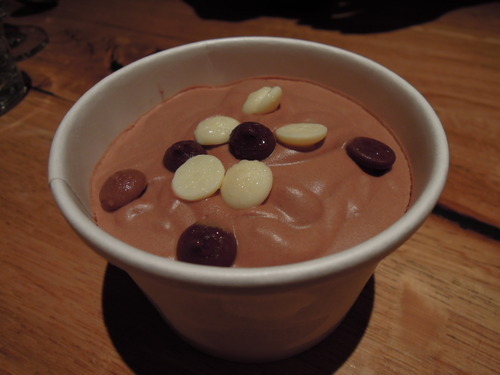 (4) The chocolate mousse was equally delightful. The mousse had a strong chocolate taste and a soothingly silky texture, lined with a layer of scrumptious chocolate brownie at the bottom; truly magnificent. Conclusion: Even though a larger branch in Soho has been opened, waiting time in the Mayfair branch can still go up to two hours, and not so infrequently either. Our tip: go as early as you physically can! This is a merely a manifestation of how absolutely scrumptious the food is, and I can assure you that it is worth every minute of a 2-hour wait.